For other uses, see Star of Bethlehem (disambiguation). 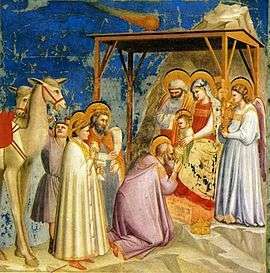 Adoration of the Magi by Florentine painter Giotto di Bondone (1267–1337). The Star of Bethlehem is shown as a comet above the child. Giotto witnessed an appearance of Halley's Comet in 1301. The Star of Bethlehem, also called the Christmas Star, revealed the birth of Jesus to the Biblical Magi, and later led them to Bethlehem, according to Christian tradition. The star appears only in the nativity story of the Gospel of Matthew, where astrologers from the east are inspired by the star to travel to Jerusalem. There they meet King Herod of Judea, and ask where the king of the Jews had been born. 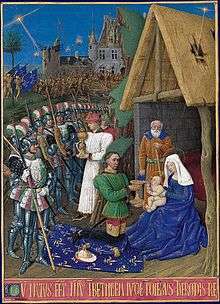 Herod, following a verse from the Book of Micah interpreted as a prophecy, directs them to Bethlehem, to the south of Jerusalem. The star leads them to Jesus' home in the town, where they worship him and give him gifts. The wise men are then given a divine warning not to return to Herod so they return home by a different route. Many Christians see the star as a miraculous sign to mark the birth of the Christ (or Messiah). Some theologians claimed that the star fulfilled a prophecy, known as the Star Prophecy. Astronomers have made several attempts to link the star to unusual astronomical events, such as a conjunction of Jupiter and Venus, a comet or a supernova. Some modern scholars do not consider the story to be describing a historical event but a pious fiction created by the author of the Gospel of Matthew. The subject is a favorite at planetarium shows during the Christmas season, although the Biblical account describes Jesus with a broader Greek word, which can mean either "infant" or "child" (paidon), rather than the more specific word for infant (brephos), possibly implying that some time has passed since the birth. The visit is traditionally celebrated on Epiphany (January 6) in Western Christianity. Now after Jesus was born in Bethlehem of Judea in the days of Herod the king, behold, wise men from the East came to Jerusalem, saying, Where is He who has been born King of the Jews? For we have seen His star in the East [or at its rising] and have come to worship Him. When Herod the king heard this, he was troubled, and all Jerusalem with him. And when he had gathered all the chief priests and scribes of the people together, he inquired of them where the Christ was to be born. Adoration of the Magi, Chartres Cathedral, by Jehan de Beauce, France, 16th century. Herod is "troubled", not because of the appearance of the star, but because the Magi have told him that a "king of the Jews" had been born, which he understands to refer to the Messiah, a leader of the Jewish people whose coming was believed to be foretold in scripture. So he asks his advisors where the Messiah would be born. They answer Bethlehem, birthplace of King David, and quote the prophet Micah. [nb 1] The king passes this information along to the Magi. Then Herod, when he had secretly called the wise men, determined from them what time the star appeared. And he sent them to Bethlehem and said, Go and search carefully for the young Child, and when you have found Him, bring back word to me, that I may come and worship Him also. When they heard the king, they departed; and behold, the star which they had seen in the East went before them, till it came and stood over where the young Child was. When they saw the star, they rejoiced with exceedingly great joy. And when they had come into the house, they saw the young Child with Mary His mother, and fell down and worshiped Him. And when they had opened their treasures, they presented gifts to Him: gold, frankincense, and myrrh. Many scholars who see the gospel nativity stories as later apologetic accounts created to establish the Messianic status of Jesus regard the Star of Bethlehem as a pious fiction. Aspects of Matthew's account which have raised questions of the historical event include: Matthew is the only one of the four gospels which mentions either the Star of Bethlehem or the Magi. In Mark 6:1-4, the author of the Gospel of Mark, considered by modern text scholars to be the oldest of the Gospels, does not appear to be aware of the Bethlehem nativity story. A character in the Gospel of John states that Jesus is from Galilee, and not Bethlehem. The Gospels often described Jesus as "of Nazareth," but never as "of Bethlehem". Scholars suggest that Jesus was born in Nazareth and that the Bethlehem nativity narratives reflect a desire by the Gospel writers to present his birth as the fulfillment of prophecy. The Matthew account conflicts with that given in the Gospel of Luke, in which the family of Jesus already live in Nazareth, travel to Bethlehem for the census, and return home almost immediately. "Adoration of the Magi", by Jean Fouquet (15th century). The Star of Bethlehem can be seen in the top right. The soldiers and castle in the background may represent the Battle of Castillon (1453). Matthew's description of the miracles and portents attending the birth of Jesus can be compared to stories concerning the birth of Augustus (63 BC). [nb 4] Linking a birth to the first appearance of a star was consistent with a popular belief that each person's life was linked to a particular star. Magi and astronomical events were linked in the public mind by the visit to Rome of a delegation of magi at the time of a spectacular appearance of Halley's Comet in AD 66, about the time the Gospel of Matthew was being composed. This delegation was led by King Tiridates of Armenia, who came seeking confirmation of his title from Emperor Nero. Ancient historian Dio Cassius wrote that, "The King did not return by the route he had followed in coming," a line echoed in Matthew's account. The ancients believed that astronomical phenomena were connected to terrestrial events. Miracles were routinely associated with the birth of important people, including the Hebrew patriarchs, as well as Greek and Roman heroes. And destroy all the sons of tumult. If, then, at the commencement of new dynasties, or on the occasion of other important events, there arises a comet so called, or any similar celestial body, why should it be matter of wonder that at the birth of Him who was to introduce a new doctrine to the human race, and to make known His teaching not only to Jews, but also to Greeks, and to many of the barbarous nations besides, a star should have arisen? Now I would say, that with respect to comets there is no prophecy in circulation to the effect that such and such a comet was to arise in connection with a particular kingdom or a particular time; but with respect to the appearance of a star at the birth of Jesus there is a prophecy of Balaam recorded by Moses to this effect: There shall arise a star out of Jacob, and a man shall rise up out of Israel. Origen suggested that the Magi may have decided to travel to Jerusalem when they "conjectured that the man whose appearance had been foretold along with that of the star, had actually come into the world". 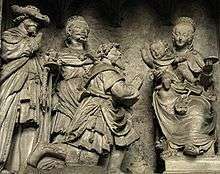 The Magi are sometimes called "kings" because of the belief that they fulfill prophecies in Isaiah and Psalms concerning a journey to Jerusalem by gentile kings. Isaiah mentions gifts of gold and incense. In the Septuagint, the Greek translation of the Old Testament probably used by Matthew, these gifts are given as gold and frankincense, similar to Matthew's "gold, frankincense, and myrrh." The gift of myrrh symbolizes mortality, according to Origen. While Origen argued for a naturalistic explanation, John Chrysostom viewed the star as purely miraculous: "How then, tell me, did the star point out a spot so confined, just the space of a manger and shed, unless it left that height and came down, and stood over the very head of the young child? And at this the evangelist was hinting when he said, "Lo, the star went before them, till it came and stood over where the young Child was." Although magi (Greek μαγοι) is usually translated as "wise men," in this context it probably means "astronomer" or "astrologer". The involvement of astrologers in the story of the birth of Jesus was problematic for the early Church, because they condemned astrology as demonic; a widely cited explanation was that of Tertullian, who suggested that astrology was allowed 'only until the time of the Gospel'. In 1614, German astronomer Johannes Kepler determined that a series of three conjunctions of the planets Jupiter and Saturn occurred in the year 7 BC. He argued (incorrectly) that a planetary conjunction could create a nova, which he linked to the Star of Bethlehem. Modern calculations show that there was a gap of nearly a degree (approximately twice a diameter of the moon) between the planets, so these conjunctions were not visually impressive. An ancient almanac has been found in Babylon which covers the events of this period, but does not indicate that the conjunctions were of any special interest. In the 20th century, Prof. Karlis Kaufmanis, an astronomer, argued that this was an astronomical event where Jupiter and Saturn were in a triple conjunction in the constellation Pisces. Archaeologist and Assyriologist Simo Parpola has also suggested this explanation. In 3–2 BC, there was a series of seven conjunctions, including three between Jupiter and Regulus and a strikingly close conjunction between Jupiter and Venus near Regulus on June 17, 2 BC. "The fusion of two planets would have been a rare and awe-inspiring event", according to Roger Sinnott. Another Venus–Jupiter conjunction occurred earlier in August, 3 BC. These events however occurred after the generally accepted date of 4 BC for the death of Herod. Since the conjunction would have been seen in the west at sunset it could not have led the magi south from Jerusalem to Bethlehem. Other writers suggest that the star was a comet. Halley's Comet was visible in 12 BC and another object, possibly a comet or nova, was seen by Chinese and Korean stargazers in about 5 BC. This object was observed for over seventy days with no movement recorded. Ancient writers described comets as "hanging over" specific cities, just as the Star of Bethlehem was said to have "stood over" the "place" where Jesus was (the town of Bethlehem). However, this is generally thought unlikely as in ancient times comets were generally seen as bad omens. The comet explanation has been recently promoted by Colin Nicholl. His theory involves a hypothetical comet which could have appeared in 6 BC. A recent (2005) hypothesis is that the star of Bethlehem was a supernova or hypernova occurring in the nearby Andromeda Galaxy. Although it is difficult to detect a supernova remnant in another galaxy, or obtain an accurate date of when it occurred, supernovae remnants have been detected in Andromeda. The Magi told Herod that they saw the star "in the East," or according to some translations, "at its rising", which may imply the routine appearance of a constellation, or an asterism. One theory interprets the phrase in Matthew 2:2, "in the east," as an astrological term concerning a "heliacal rising." This translation was proposed by Edersheim and Heinrich Voigt, among others. The view was rejected by the philologist Franz Boll (1867–1924). Two modern translators of ancient astrological texts insist that the text does not use the technical terms for either a heliacal or an acronycal rising of a star. However, one concedes that Matthew may have used layman's terms for a rising. Astronomer Michael R. Molnar argues that the "star in the east" refers to an astronomical event with astrological significance in the context of ancient Greek astrology. He suggests a link between the Star of Bethlehem and a double occultation of Jupiter by the moon on March 20 and April 17 of 6 BC in Aries, particularly the second occultation on April 17. Occultations of planets by the moon are quite common, but Firmicus Maternus, an astrologer to Roman Emperor Constantine, wrote that an occultation of Jupiter in Aries was a sign of the birth of a divine king. He argues that Aries rather than Pisces was the zodiac symbol for Judea, a fact that would affect previous interpretations of astrological material. Molnar’s theory was debated by scientists, theologians, and historians during a colloquium on the Star of Bethlehem at the Netherlands’ University of Groningen in October 2014. Harvard astronomer Owen Gingerich supports Molnar’s explanation but noted technical questions. "The gospel story is one in which King Herod was taken by surprise," said Gingerich. "So it wasn’t that there was suddenly a brilliant new star sitting there that anybody could have seen [but] something more subtle." Astronomer David A. Weintraub says, "If Matthew’s wise men actually undertook a journey to search for a newborn king, the bright star didn’t guide them; it only told them when to set out." The events were quite close to the sun and would not have been visible to the naked eye. Attorney Frederick Larson examined the biblical account in the Gospel of Matthew, chapter 2 and found the following nine qualities of Bethlehem's Star: It signified birth, it signified kingship, it was related to the Jewish nation, and it rose "in the East"; King Herod had not been aware of it; it appeared at an exact time; it endured over time; and, according to Matthew, it was in front of the Magi when they traveled south from Jerusalem to Bethlehem, and then it stopped over Bethlehem. Using astronomy software, and an article written by astronomer Craig Chester based on the work of Ernest Martin, Larson thinks all nine characteristics of the Star of Bethlehem are found in events that took place in the skies of 3-2 BC. Highlights include a triple conjunction of Jupiter, called the king planet, with the fixed star Regulus, called the king star, starting in September 3 BC. Larson believes that may be the time of Jesus' conception. By June of 2 BC, nine months later, the human conception period, Jupiter had continued moving in its orbit around the sun and appeared in close conjunction with Venus with Venus in June of 2 BC. In Hebrew Jupiter is called "Sedeq", meaning "righteousness", a term also used for the Messiah, and suggested that because the planet Venus represents love and fertility, so Chester had suggested astrologers would have viewed the close conjunction of Jupiter and Venus as indicating a coming new king of Israel, and Herod would have taken them seriously. Astronomer Dave Reneke independently found the June 2 BC planetary conjunction, and noted it would have appeared as a "bright beacon of light". Jupiter next continued to move and then it stopped in its apparent retrograde motion on December 25 of 2 BC over the town of Bethlehem. Since planets in their orbits have a "stationary point", a planet moves eastward through the stars but "After it passes the opposite point in the sky from the sun, it appears to slow, come to a full stop, and move backward (westward) for some weeks. Again it slows, stops, and resumes its eastward course," said Chester. The date of December 25 that Jupiter appeared to stop while in retrograde took place in the season of Hanukkah, and is the date later chosen to celebrate Christmas. If the story of the Star of Bethlehem described an actual event, it might identify the year Jesus was born. The Gospel of Matthew describes the birth of Jesus as taking place when Herod was king. According to Josephus, Herod died after a lunar eclipse and before a Passover Feast. The eclipse is usually identified as the eclipse of March 13, 4 BC. Other scholars suggested dates in 5 BC, because it allows seven months for the events Josephus documented between the lunar eclipse and the Passover than the 29 days allowed by lunar eclipse in 4 BC. Others suggest it was an eclipse in 1 BC. The narrative implies that Jesus was born sometime between the first appearance of the star and the appearance of the Magi at Herod's court. That the king is said to have ordered the execution of boys two years of age and younger, implies that the Star of Bethlehem appeared within the preceding two years. Some scholars date the birth of Jesus as 6–4 BC, while others suggest Jesus' birth was in 3/2 BC. The Gospel of Luke says the census from Caesar Augustus took place when Quirinius was governor of Syria. Tipler suggests this took place in AD 6, nine years after the death of Herod,and that the family of Jesus left Bethlehem shortly after the birth. Some scholars explain the apparent disparity as an error on the part of the author of the Gospel of Luke, concluding that he was more concerned with creating a symbolic narrative than a historical account, and was either unaware of, or indifferent to, the chronological difficulty. However, there is some debate among Bible translators about the correct reading of Luke 2:2. Instead of translating the registration as taking place "when" Quirinius was governor of Syria, some versions translate it as "before" or use "before" as an alternative, which Harold Hoehner, F.F. Bruce, Ben Witherington and others have suggested may be the correct translation. While not in agreement, Emil Schürer also acknowledged that such a translation can be justified grammatically. According to Josephus, the tax census conducted by the Roman senator Quirinius particularly irritated the Jews, and was one of the causes of the Zealot movement of armed resistance to Rome. From this perspective, Luke may have been trying to differentiate the census at the time of Jesus’ birth from the tax census mentioned in Acts 5:37 that took place under Quirinius at a later time. One ancient writer identified the census at Jesus’ birth, not with taxes, but with a universal pledge of allegiance to the emperor. Jack Finegan noted some early writers' reckoning of the regnal years of Augustus are the equivalent to 3/2 BC, or 2 BC or later for the birth of Jesus, including Irenaeus (3/2 BC), Clement of Alexandria (3/2 BC), Tertullian (3/2 BC), Julius Africanus (3/2 BC), Hippolytus of Rome (3/2 BC), Hippolytus of Thebes (3/2 BC), Origen (3/2 BC), Eusebius of Caesarea (3/2 BC), Epiphanius of Salamis (3/2 BC), Cassiodorus Senator (3 BC), Paulus Orosius (2 BC), Dionysus Exiguus (1 BC), and Chronographer of the Year 354 (AD 1). Finegan places the death of Herod in 1 BC, and says if Jesus was born two years or less before Herod the Great died, the birth of Jesus would have been in 3 or 2 BC. Finegan also notes the Alogi reckoned Christ's birth with the equivalent of 4 BC or AD 9. Russian icon of the Nativity. The Star of Bethlehem is depicted at the center top as a dark semicircle, with a single ray coming down. ^ "Hymns of the Feast". Feast of the Nativity of our Lord and Savior Jesus Christ. Greek Orthodox Archdiocese of America. 2009. In Orthodox Christian iconography, the Star of Bethlehem is often depicted not as golden, but as a dark aureola, a semicircle at the top of the icon, indicating the Uncreated Light of Divine grace, with a ray pointing to "the place where the young child lay" (Matt 2:9). Sometimes the faint image of an angel is drawn inside the aureola. Mormons believe that the Star of Bethlehem was an actual astronomical event visible the world over. In the Book of Mormon, which they believe contains writings of ancient prophets, Samuel the Lamanite prophesies that a new star will appear as a sign that Jesus has been born, and Nephi later writes about the fulfillment of this prophecy. Among Jehovah's Witnesses the Star of Bethlehem is seen as a product of Satan, rather than a sign from God, since the star led the astrologers to Jerusalem where they met King Herod's plan to kill Jesus. In The Desire of Ages, Ellen White states "That star was a distant company of shining angels, but of this the wise men were ignorant." Paintings and other pictures of the Adoration of the Magi may include a depiction of the star in some form. In the fresco by Giotto di Bondone, it is depicted as a comet. In the tapestry of the subject designed by Edward Burne-Jones (and in the related watercolour), the star is held by an angel. The colourful star lantern known as a paról is a cherished and ubiquitous symbol of the holiday for Filipinos, its design and light recalling the star. In its basic form, the paról has five points and two "tails" that evoke rays of light pointing the way to the stable, and candles inside the lanterns have been superseded by electric illumination. In the Church of the Nativity in Bethlehem, a silver star with 14 undulating rays marks the location traditionally claimed to be that of Jesus' birth. The Star of Bethlehem is a newly composed Christmas Oratorio by Irish composer Colm Ó Foghlú with a libretto by Gráinne Uí Chaomhánaigh and Bríd Ní Ghruagáin. It was first broadcast as Ceol ar Snámh ón Spéir Anuas in the Irish language on RTE Radio1 & RTE Raidió na Gaeltachta (Ireland's national broadcaster) on Christmas Day 2012. It was specially written for Lynn Hilary (soprano), Niamh Ní Charra (concertina), Aoife Ní Bhriain (fiddle) and Noreen O'Donoghue (Irish harp). It was performed by The Orchestra of Ireland and New Dublin Voices Choir. "The Star" was an episode of The Twilight Zone during its run in the 1980s, based on the science fiction short story "The Star" by English writer Arthur C. Clarke. A distant space ship comes across a supernova that was calculated to have occurred in approximately 3,000BC, at a distance of 3,000 light-years. A well-developed civilization was eradicated by the supernova and one of the astronauts, who was also a priest, had a crisis of faith about why God would let such a civilization die to herald the birth of Christ. Another astronaut shows him a recording from that civilization populace stating that they realized they were at the peak of their time and had to make way for a new people. They had left their art and music behind as a legacy to the future generations. ↑ Matthew 2:5–6. Matthew's version is a conflation of Micah 5:2 and 2 Samuel 5:2. ↑ Matthew 2:16 This is presented as a fulfillment of a prophecy and echoes the killing of firstborn by pharaoh in Exodus 11:1–12:36. ↑ Judges 13:5–7 is sometimes identified as the source for Matthew 2:23 because Septuagint ναζιραιον (Nazirite) resembles Matthew's Ναζωραῖος (Nazorean). But few scholars accept the view that Jesus was a Nazirite. ↑ The god Apollo was said to have conceived with Augustus' mother and there was a "public portent" indicating that a king of Rome would soon be born. ( Suetonius, C. Tranquillus, "The Divine Augustus", The Lives of the Twelve Caesars chapter 94 ). 1 2 3 John, Mosley. "Common Errors in 'Star of Bethlehem' Planetarium Shows". Retrieved 2008-06-05. 1 2 Matthew 2:2. New Revised Standard Version. ↑ Matthew 2:1–4 New King James Version (1982). ↑ Concordances on the meaning of the word "netzer" on Bible Hub. Retrieved December 29, 2015. ↑ Commentaries for Matthew 2:23 on Bible Hub. Retrieved on December 29, 2005. ↑ Isaiah chapter 11, verse 1 on Bible Hub with commentaries. Retrieved on December 29, 2015. ↑ Bart D. Ehrman, Jesus: apocalyptic prophet of the new millennium, Oxford University Press 1999, page 38. 1 2 3 Jenkins, R.M. (June 2004). "The Star of Bethlehem and the Comet of AD 66" (PDF). Journal of the British Astronomy Association (114). pp. 336–43. Retrieved 2009-07-04. ↑ Josephus, Flavius, The Wars of the Jews, retrieved 2008-06-07 Translated by: William Whiston. ↑ Adamantius, Origen. "Contra Celsum". Retrieved 2008-06-05. , Book I, Chapter LIX. 1 2 Adamantius, Origen. "Contra Celsum". . Book I, Chapter LX. 1 2 3 4 5 Mark, Kidger. "Chinese and Babylonian Observations". Retrieved 2008-06-05. ↑ Greg Garrison (30 June 2015). "Is this what the Star of Bethlehem looked like? Venus, Jupiter put on a show". Alabama Media Group (AL.com). Retrieved 14 July 2015. ↑ Colin R. Nicholl. 2015. The Great Christ Comet: Revealing the True Star of Bethlehem. Crossway. ↑ Interview Greg Cootsona. "What Kind of Astronomical Marvel was the Star of ... - Christianity Today". ChristianityToday.com. ↑ Guillermo Gonzalez. "The Great Christ Comet: Revealing the True Star of Bethlehem". TGC - The Gospel Coalition. 1 2 Frank J. Tipler (2005). "The Star of Bethlehem: A Type Ia/Ic Supernova in the Andromeda Galaxy?" (PDF). The Observatory. 125: 168–74. Bibcode:2005Obs...125..168T. ↑ Eugene A. Magnier; Francis A. Primini; Saskia Prins; Jan van Paradijs; Walter H. G. Lewin (1997). "ROSAT HRI Observations of M31 Supernova Remnants". The Astrophysical Journal. 490 (2): 649–652. doi:10.1086/304917. ↑ Edersheim, Alfred. The Life and times of Jesus the Messiah. Peabody, (MA: Hendrickson, 1993), several references, chapter 8. ↑ Hutchison, Dwight Reed. The Lion Led the Way, Third Edition. St. Paul-Trois-Chateaux, France: Editions Signes Celestes, 2015. Hutchison, Dwight. A Sign Over Bethlehem. St. Paul-Trois-Chateaux, France: Editions Signes Célestes, 2015. ↑ Jupiter's synodic cycle is composed of the following: heliacal rising, first station, acronycal rising, second station and heliacal setting. ↑ Barthel, Peter, and George Van Kooten, eds. The Star of Bethlehem and the Magi: Interdisciplinary Perspectives from Experts on the Ancient Near East, the Greco-Roman World, and Modern Astronomy, (Leiden: Brill, 2015), p. 4. ↑ Matthew chapter 2 on Bible Gateway, Amplified Version with footnotes. Retrieved on December 22, 2015. ↑ Lawton, Kim. "Christmas star debate gets its due on Epiphany". USA Today. January 5, 2008. Retrieved on December 19, 2015. 1 2 Herzog, Travis. "Did the Star of Bethlehem exist?" abc13 Eyewitness News. December 20, 2007. Retrieved on December 19, 2015. ↑ Matthew chapter 2, verse 2. Bible Hub with commentaries. Retrieved on December 19, 2015. ↑ Matthew chapter 2, verse 3. Bible Hub with commentaries. Retrieved on December 19, 2015. ↑ Matthew chapter 2 verse 7. Bible Hub with commentaries. Retrieved on December 19, 2015. ↑ Matthew chapter 2, verses 2-10. Bible Hub with whole chapter and commentaries. Retrieved on December 19, 2015. ↑ Gospel of Matthew chapter 2 verse 9. Bible Hub with commentaries. Retrieved on December 19, 2015. ↑ Ireland, Michael. "Evidence emerges for Star of Bethlehem’s reality". Assist News Service. Christian Headlines. October 18, 2007. Retrieved on December 19, 2015. 1 2 3 Chester, Craig. "The Star of Bethlehem". Imprimis. December 1993, 22(12). Originally presented at Hillsdale College during fall 1992. Retrieved on December 19, 2015. ↑ Vaughn, Cliff. "The Star of Bethlehem". Ethics Daily. November 26, 2009. Retrieved on January 2, 2016. 1 2 3 4 Scripps Howard News Service. "Astronomer Analyzes The Star Of Bethlehem". The Chicago Tribune. December 24, 1993. Retrieved on December 19, 2015. 1 2 Lawton, Kim. "Star of Bethlehem". Interview with Rick Larson. PBS, Religion & Ethics Newsweekly. December 21, 2007. Retrieved on December 19, 2015. ↑ Rao, Joe. "Was the Star of Bethlehem a star, comet … or miracle?" NBC News. Updated December 12, 2011. Includes a brief interactive at the bottom, “What’s the story behind the Star?” showing retrograde motion and the 3-2 BC planetary conjunctions. Retrieved on January 2, 2016. 1 2 3 4 Foust, Michael. Baptist Press. December 14, 2007. Retrieved on December 19, 2015. ↑ The Free Dictionary by Farlex; Medical Dictionary. Retrieved on February 12, 2016. ↑ Telegraph. "'Jesus was born in June", astronomers claim". The Telegraph. December 9, 2008. Retrieved on December 22, 2015. ↑ "History of Christmas". History. Retrieved on December 22, 2015. ↑ Josephus, Flavius. ~93 AD. Antiquities of the Jews. Book 17, chapter 9, paragraph 3 (17.9.3) Bible Study Tools website. First sentence of paragraph 3 reads: "Now, upon the approach of that feast ..." Retrieved on March 16, 2016. ↑ Josephus, Flavius. ~93 AD. The War of the Jews. Book 2, chapter 1, paragraph 3 (2.1.3) Bible Study Tools website. About one-third through paragraph three it reads: "And indeed, at the feast ...". Retrieved on March 16, 2016. ↑ Timothy David Barnes, "The Date of Herod’s Death," Journal of Theological Studies ns 19 (1968), 204–19. P. M. Bernegger, "Affirmation of Herod’s Death in 4 B.C.," Journal of Theological Studies ns 34 (1983), 526–31. 1 2 Andrew Steinmann, From Abraham to Paul: A Biblical Chronology. (St. Louis, MO: Concordia Pub. House, 2011), Print. pp. 219-256. 1 2 W.E. Filmer, "The Chronology of the Reign of Herod the Great". The Journal of Theological Studies, 1966. 17(2): p. 283-298. ↑ Finegan, Jack. Handbook of Biblical Chronology: Principles of Time Reckoning in the Ancient World and Problems of Chronology in the Bible. Peabody, MA: Hendrickson, 1998, 2015. pp. 238-279. ↑ Jesus Christ. Encyclopædia Britannica. Chicago. 2010. ↑ Luke 2:2 Luke chapter 2 verse in parallel translations on Bible Hub. Retrieved on March 3, 2016. ↑ Ralph Martin Novak, Christianity and the Roman Empire: background texts (Continuum International, 2001), page 293. ↑ Raymond E. Brown, Christ in the Gospels of the Liturgical Year, (Liturgical Press, 2008), page 114. See, for example, James Douglas Grant Dunn, Jesus Remembered, (Eerdmans, 2003) p344. Similarly, Erich S. Gruen, 'The expansion of the empire under Augustus', in The Cambridge ancient history Volume 10, p157, Geza Vermes, The Nativity, Penguin 2006, p.96, W. D. Davies and E. P. Sanders, 'Jesus from the Jewish point of view', in The Cambridge History of Judaism ed William Horbury, vol 3: the Early Roman Period, 1984, Anthony Harvey, A Companion to the New Testament (Cambridge University Press 2004), p221, Meier, John P., A Marginal Jew: Rethinking the Historical Jesus. Doubleday, 1991, v. 1, p. 213, Brown, Raymond E. The Birth of the Messiah: A Commentary on the Infancy Narratives in Matthew and Luke. London: G. Chapman, 1977, p. 554, A. N. Sherwin-White, pp. 166, 167, Millar, Fergus (1990). "Reflections on the trials of Jesus". A Tribute to Geza Vermes: Essays on Jewish and Christian Literature and History (JSOT Suppl. 100) [eds. P.R. Davies and R.T. White]. Sheffield: JSOT Press. pp. 355–81. repr. in Millar, Fergus (2006). "The Greek World, the Jews, and the East". Rome, the Greek World and the East. University of North Carolina Press. 3: 139–163. ↑ Luke 2:2 commentaries on Bible Hub. Retrieved on March 3, 2016. ↑ Luke 2:2 in the Orthodox Jewish Bible (OJB)on BibleGateway. Retrieved on March 3, 2016. ↑ Luke 2:2 in the New International Version NIV) Bible on BibleGateway. Retrieved on March 3, 2016. ↑ Luke 2:2 in the English Standard Version (ESV) Bible on BibleGateway. Retrieved on March 3, 2016. ↑ Luke 2:2 in Holman Christian Standard Bible (HSCB) on BibleGateway. Retrieved on March 3, 2016. ↑ Brindle, Wayne. "The Census And Quirinius: Luke 2:2." JETS 27/1 (March1984) 43-52. Other scholars cited in Brindle's article include A. Higgins, N. Turner, P. Barnett, I. H. Marshall and C. Evan. ↑ Emil Schürer, Géza Vermès, and Fergus Millar, The History of the Jewish People in the Age of Jesus Christ (175 B.C.-A.D. 135), (Edinburgh: Clark, 1973 and 1987), 421. ↑ Josephus, Flavius. ~93 AD. Antiquities of the Jews. Book 18, chapter 1, paragraph 1 (hereafter noted as 18.1.1) Entire book free to read online. Bible Study Tools website. Scroll down from 18.1.1 to find Jewish revolt also mentioned in 18.1.6. Retrieved on March 3, 2016. ↑ Acts of the Apostles, chapter 5, verse 2 with commentaries. Bible Hub. Retrieved on March 16, 2016. ↑ Vincent, Marvin R. Vincent's Word Studies. Luke chapter 2, verse 2. Bible Hub. Retrieved on March 16, 2016. ↑ Finegan, Jack. Handbook of Biblical Chronology: Principles of Time Reckoning in the Ancient World and Problems of Chronology in the Bible. Peabody, MA: Hendrickson, 1998. pp. 279-292. ↑ Finegan, Jack. Handbook of Biblical Chronology: Principles of Time Reckoning in the Ancient World and Problems of Chronology in the Bible. Peabody, MA: Hendrickson, 1998. p. 301. ↑ Finegan, Jack. Handbook of Biblical Chronology: Principles of Time Reckoning in the Ancient World and Problems of Chronology in the Bible. Peabody, MA: Hendrickson, 1998. pp. 289-290. ↑ The Desire of Ages, pp. 60. Wikimedia Commons has media related to Star of Bethlehem.